Herbert George Wells was an English writer best known for such science fiction novels as The Time Machine, The War of the Worlds, The Invisible Man, and The Island of Doctor Moreau. He was a prolific writer of both fiction and non-fiction, and produced works in many different genres, including contemporary novels, history, and social commentary. He was also an outspoken socialist. The Time Machine is a book by H. G. Wells, first published in 1895 The book’s protagonist is an amateur inventor or scientist living in London identified simply as The Time Traveller. Having demonstrated to friends using a miniature model that time is a fourth dimension, and that a suitable apparatus can move back and forth in this fourth dimension, he completes the building of a larger machine capable of carrying himself. He then immediately sets off on a journey into the future. The Time Traveller details the experience of time travel and the evolution of his surroundings as he moves through time. While travelling through time, his machine allows him to observe the changes of the outside world in fast motion. He observes the sun and moon traversing the sky and the changes to the buildings and landscape around him as he travels through time. His machine produces a sense of disorientation to its occupant, and a blurring or faintness of the surroundings outside the machine. FCIT. "H.G. Wells author page." Lit2Go ETC. Web. 25 April 2019. 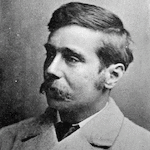 <https://etc.usf.edu/lit2go/authors/128/hg-wells/>. FCIT, "H.G. Wells author page." Accessed April 25, 2019. https://etc.usf.edu/lit2go/authors/128/hg-wells/.